Would you like to get away to a quiet and beautiful setting? 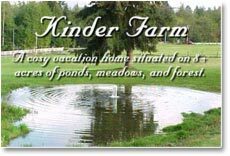 Picture an eight acre farm nestled in the heart of the rainshadow in Sequim, Washington... Kinder Farm has plenty of room for families with children or just a couple. There are two serene ponds where wild ducks build nests for their young. We have pigmy goats, llamas, wild deer and the come and go. 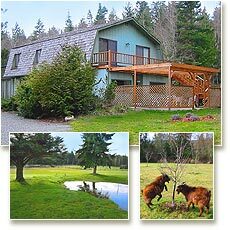 Kinder Farm is at the base of the Olympic Mountains, near the famous Dungeness Valley and Straits of Juan de Fuca. Whether you want to get outside and hike the mountains, forests and beaches, or simply enjoy relaxing at the farm, you'll be glad you stayed with us at Kinder Farm. See our upstairs and downstairs suites. Discover Sequim and the Olympic Peninsula. Find out more about our special events, the Quilting Retreats and Early Childhood Retreats. Then, find out about booking your stay.